Despite being ill, we decided to out for a bit today to get some sun. The Boy wanted to play with his new beach ball octopus and water balloons, and I decided to get one of the raised beds ready for planting. We already tilled it, but I needed to fill it up with some more dirt and stuff like that. While I was turning the dirt over, I saw them. 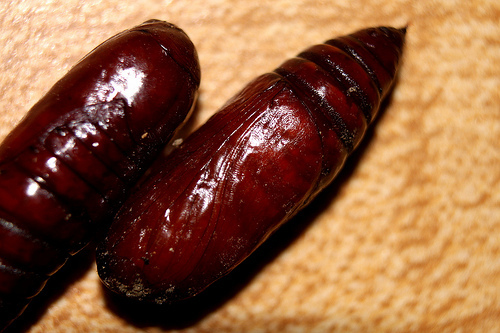 Two large, reddish-brown pupae. Hmm. Right where the zucchini plants were last year. I dug them out and set them aside. I actually forgot about them until I went out to put the kitchen scraps in the compost a few hours later. The compost is looking quite wonderful, too. It’s nice and brown and quite warm to the touch. Last year at this time it was just frozen and useless. 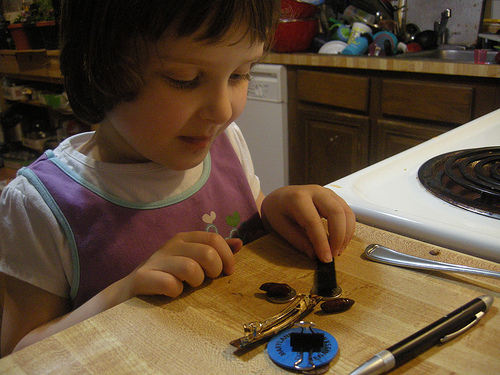 Anyway, we brought the pupae inside and the kids played with them a bit while we looked them up online to try to identify them. My 5 year old enjoyed making them little “houses” and the rest of us were happy to watch them wriggle around. As far as I can tell, they are, in fact, the pupae of my sworn enemy, the squash vine borer moth. Last year they destroyed my zucchini and yellow squash plants. What happens is the moth lays infinitesimally tiny eggs on your innocent squash vines right at the base. When the caterpillars hatch, they bore down into the vine and stay in there. They eat it out from inside, slowly growing and scooting up the middle. 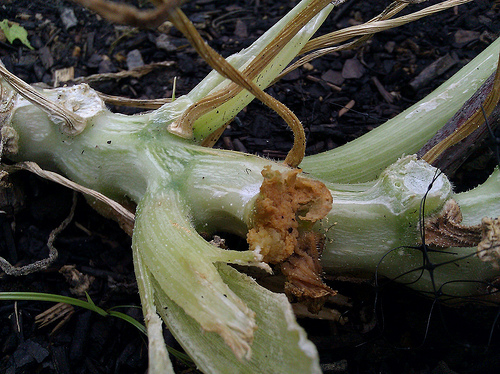 The squash plant slowly dies, and one day you notice this really foul, orange, cheese-like substance coming out of your vines. I didn’t know what it was until it was too late. I actually did surgery on my vines, making a 2-3 inch incision in each one to pry out the caterpillar and destroy it, much to my son’s dismay. He loves anything worm-like. The plants got better for a few weeks, then succumbed to the humidity by developing a fatal fungus that they couldn’t fight off. 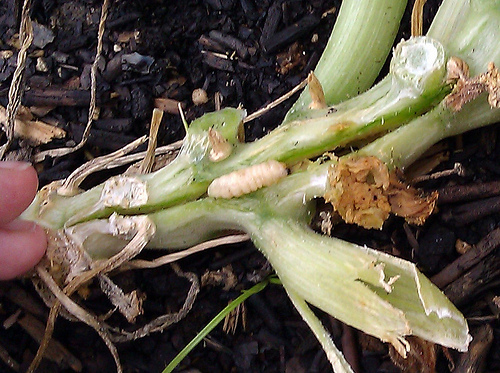 I do not like squash vine borer worm moths. My husband sent the pictures off to bugguide.net, (here is the page for the squash vine borer worm) for confirmation of the species and so they would have a picture. Right now they are sitting in a container on the dining room table. We’re trying to figure out if we should keep them around and see what comes out and make it more nature study, or if we should just feed them to the lizard. It’s the food web, right? My sworn enemy as well! I was just googling the pupa and found your post. I was afraid it might be some cool moth that I was putting to death….or was it what I hoped and feared…the SQUASH VINE BORER! Last year I made several surgical removals of vine borers. I even went out at night and tried shining a flashlight through the vines. I thought I might be able to skewer them through the stem. My husband thinks I am crazy. Oh! We let it hatch back out to see what it was — as it turns out is wasn’t the squash vine borer… it’s one of the species of cut worms! (UGH!) So, um, even worse!